At the beginning of the novel I was mostly concerned with Rachel and her plans for her future. I held her in my heart as a parent for a child and also as a child yearning for connection again with her parent. Her early childhood had been filled with idyllic happiness which was abruptly broken by the death of her mother so her sense of abandonment was clear and understandable. I was nervous about the way her return would affect her and was unimpressed with her father and even more unimpressed with his new fiance. Quite apart from Rachel's story there was full thread of narrative around the uprising in Kenya that gradually took over the story. I felt torn as Michael, Rachel and I'm sure, Rachel's father, felt. Of course I wanted her family and friends to be safe and for the atrocities against other humans to stop- but at the center of the issue was an immense empathy for the Africans trying to regain their heritage, their land and their people. I'd like to think that mos‎t expats feel they are sharing a space with those who were there first but perhaps this is a concept only available to a few generations past the ones in this story. I did feel that Rachel's father had respect for the land and the people he was living on but his relationship with Sara seemed to have changed him from the man he had been with his first wife. The author doesn't really address her father's grief of losing her mother which gives us little insight into his thought process. I did appreciate the descriptions of places, sounds and colours- the connection to the land and the places helped connect me also with the characters. 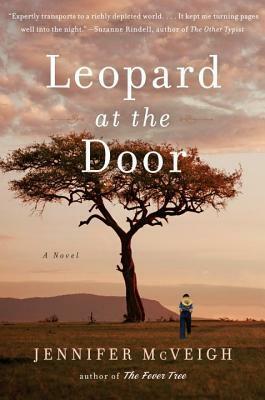 Leopard at the Door was engrossing- very difficult to read in many places but that should be expected.